Four snapshots from the computer simulation of a collision between the moon and a smaller companion moon show most of the companion moon is accreted as a pancake-shaped layer, forming a mountainous region on one side of the moon. Credit: M. Jutzi and E. Asphaug, Nature. The mountainous region on the far side of the moon, known as the lunar farside highlands, may be the solid remains of a collision with a smaller companion moon, according to a new study by planetary scientists at the University of California, Santa Cruz. The striking differences between the near and far sides of the moon have been a longstanding puzzle. The near side is relatively low and flat, while the topography of the far side is high and mountainous, with a much thicker crust. The new study, published in the August 4 issue of Nature, builds on the "giant impact" model for the origin of the moon, in which a Mars-sized object collided with Earth early in the history of the solar system and ejected debris that coalesced to form the moon. The study suggests that this giant impact also created another, smaller body, initially sharing an orbit with the moon, that eventually fell back onto the moon and coated one side with an extra layer of solid crust tens of kilometers thick. "Our model works well with models of the moon-forming giant impact, which predict there should be massive debris left in orbit about the Earth, besides the moon itself. It agrees with what is known about the dynamical stability of such a system, the timing of the cooling of the moon, and the ages of lunar rocks," said Erik Asphaug, professor of Earth and planetary sciences at UC Santa Cruz. 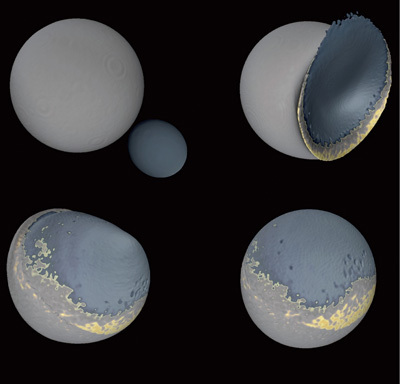 Asphaug, who coauthored the paper with UCSC postdoctoral researcher Martin Jutzi, has previously done computer simulations of the moon-forming giant impact. He said companion moons are a common outcome of such simulations. In the new study, he and Jutzi used computer simulations of an impact between the moon and a smaller companion (about one-thirtieth the mass of the moon) to study the dynamics of the collision and track the evolution and distribution of lunar material in its aftermath. In such a low-velocity collision, the impact does not form a crater and does not cause much melting. Instead, most of the colliding material is piled onto the impacted hemisphere as a thick new layer of solid crust, forming a mountainous region comparable in extent to the lunar farside highlands. "Of course, impact modelers try to explain everything with collisions. In this case, it requires an odd collision: being slow, it does not form a crater, but splats material onto one side," Asphaug said. "It is something new to think about." He and Jutzi hypothesize that the companion moon was initially trapped at one of the gravitationally stable "Trojan points" sharing the moon's orbit, and became destabilized after the moon's orbit had expanded far from Earth. "The collision could have happened anywhere on the moon," Jutzi said. "The final body is lopsided and would reorient so that one side faces Earth." The model may also explain variations in the composition of the moon's crust, which is dominated on the near side by terrain comparatively rich in potassium, rare-earth elements, and phosphorus (KREEP). These elements, as well as uranium and thorium, are believed to have been concentrated in the magma ocean that remained as molten rock solidified under the moon's thickening crust. In the simulations, the collision squishes this KREEP-rich layer onto the opposite hemisphere, setting the stage for the geology now seen on the near side of the moon. Other models have been proposed to explain the formation of the highlands, including one published last year in Science by Jutzi and Asphaug's colleagues at UC Santa Cruz, Ian Garrick-Bethell and Francis Nimmo. Their analysis suggested that tidal forces, rather than an impact, were responsible for shaping the thickness of the moon's crust. "The fact that the near side of the moon looks so different to the far side has been a puzzle since the dawn of the space age, perhaps second only to the origin of the moon itself," said Nimmo, a professor of Earth and planetary sciences. "One of the elegant aspects of Erik's article is that it links these two puzzles together: perhaps the giant collision that formed the moon also spalled off some smaller bodies, one of which later fell back to the Moon to cause the dichotomy that we see today." For now, he said, there is not enough data to say which of the alternative models offers the best explanation for the lunar dichotomy. "As further spacecraft data (and, hopefully, lunar samples) are obtained, which of these two hypotheses is more nearly correct will become clear," Nimmo said. The new study was supported by NASA's Planetary Geology and Geophysics Program. Simulations were run on the NSF-sponsored UC Santa Cruz astrophysics supercomputer pleiades.